Not long after we began referring to him as “our father, Andrew Glynn, the painter,” we began asking him what it was like to be Andrew Glynn the painter, and not long after we began asking him that we began asking him what it was like to make paintings. Our questions progressed from “What are you doing?” to “How do you do it?” and eventually arrived at “Why do you do it?” Underlying that question, from two little girls of twelve, were, our father decided, some very deep questions about art and the making of art. He answered us with the seriousness that he thought we deserved, sometimes very seriously indeed, and sometimes not very seriously at all. We wrote every answer in a little book, taking turns. He had given us the book. He had told us to write his answers in it. “Oh,” we said, or at least one of us said, while the other wrote it in the little book. The house that we lived in when we began asking our father, Andrew Glynn, the painter, about his art, had been the carriage house for a mansion, a place of local renown, which had burned to the ground. Our father’s studio filled half of the ground floor of the house. The family living space occupied the other half. The bedrooms were on the second floor. We shared one. Behind the house was a walled garden where, in good weather, we sunned ourselves while our mother sat in the shade of an old arbor, writing advertising jingles. 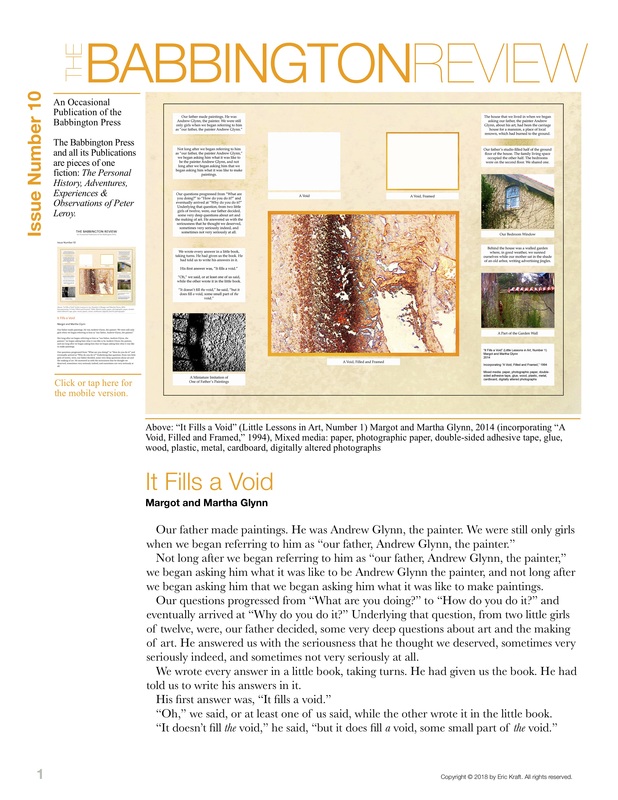 Margot and Martha Glynn create photographs and mixed media artworks that combine images and text. By reiterative abstraction of both content and container, they often create several similar yet unique works, upon which thoughts that have apparently just been developed are manifested: notes are made and then crossed out again, “mistakes” are repeated. From an early age, the Glynns have been fascinated by the traditional understanding of the human condition. With influences as diverse as Nietzsche, Roy Lichtenstein, and of course their father, Andrew Glynn, the painter, Margot and Martha generate insights from both explicit and implicit meanings. At times, the internal dynamic of the negative space in their work threatens to penetrate the inherent overspecificity of the content. What starts out as hope soon becomes corrupted into a cacophony of lust, leaving only a sense of dread and the possibility of a new reality. Margot and Martha Glynn currently live and work in New York. The Glynns’ works are often about contact with architecture and basic living elements. Energy (heat, light, water), space and landscape are examined in less obvious ways and sometimes developed in absurd ways. By manipulating the viewer to create confusion, the Glynns create intense personal moments by means of rules and omissions, acceptance and refusal, luring the viewer round and round in circles. In a search for new methods to “read the city” and “read the self” the Glynns’ focus on the idea of “public space” contrasted with “private space” and more specifically on spaces where anyone can do anything at any given moment and spaces where one cannot: the non-private space versus the private space, the non-privately-owned space versus the intimately guarded space, space that is economically uninteresting versus space that is owned. The Glynns’ mixed media artworks do not reference recognizable form. The results are deconstructed to the extent that meaning is shifted and possible interpretation becomes multifaceted. The Glynns’ works are on the one hand touchingly beautiful, on the other hand painfully attractive. Again and again, the artists leave us orphaned with a mix of conflicting feelings and thoughts. As temporal derivatives become reconfigured through frantic and diverse practice, the viewer is left with a clue to the darkness of our world. On April 16, 2018, The Babbington Press published Eric Kraft’s new novel, Albertine’s Overcoat. Albertine’s Overcoat is the eleventh novel in Kraft’s voluminous work of fiction, The Personal History, Adventures, Experiences & Observations of Peter Leroy. Albertine’s Overcoat is, among many other things, an exploration of a notion that may underlie every memoir and drive every memoirist: the idea that a life, like a work of art, is incomplete without an audience. It’s also one of literature’s great love stories.